In a culture saturated by empty messages and constant motion, our hearts long for a refuge. Our search for security and pursuit of peace will ultimately lead us to this realization we were made to dwell in the presence of our Creator. The fellowship that was broken by our sin has been healed by our Savior. Through Christ, we can draw near to God and find rest for our souls. 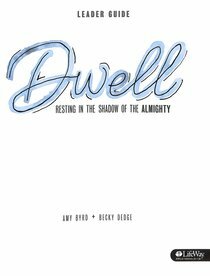 This eight-session resource will help teen girls discover the beauty of dwelling with God and why it is so important to rest in His presence. In the first four sessions, girls will examine what it means to dwell on the Word of God, in the presence of God, and with the people of God. They will learn how to move past the distractions that hinder an intimate relationship with the Father and focus on the delight found only in Him. Through the last four sessions, they will dwell on Psalm 91 and experience the joy of resting in the shadow of the Almighty. Amy Byrd Amy has a desire to make much of Jesus and loves all things student ministry. She has the joy to serve as the Director of Girls Ministry at Hunter Street Baptist Church in Birmingham, AL. Amy loves spending time with her husband, William, and her family and dear friends. In addition to her role at HSBC, Amy also serves on the leadership team for LifeWay Girls Ministry. Her ultimate desire is to see girls know their worth as daughters of the Most High and know Him as their Savior. Becky Dedge Becky longs to see girls love Jesus and know their identity and satisfaction is in Christ, not the world. The Lord has allowed her to serve in student ministry for a little over 10 years. Becky is currently on staff with Hunter Street Baptist Church Student Ministry in Birmingham, AL. It is here that she lives with her husband and 2 year old son. God has been so gracious, and she is thankful to be a part of His work."